I am visiting Denmark this summer. I found my hotel on Trip Advisor. 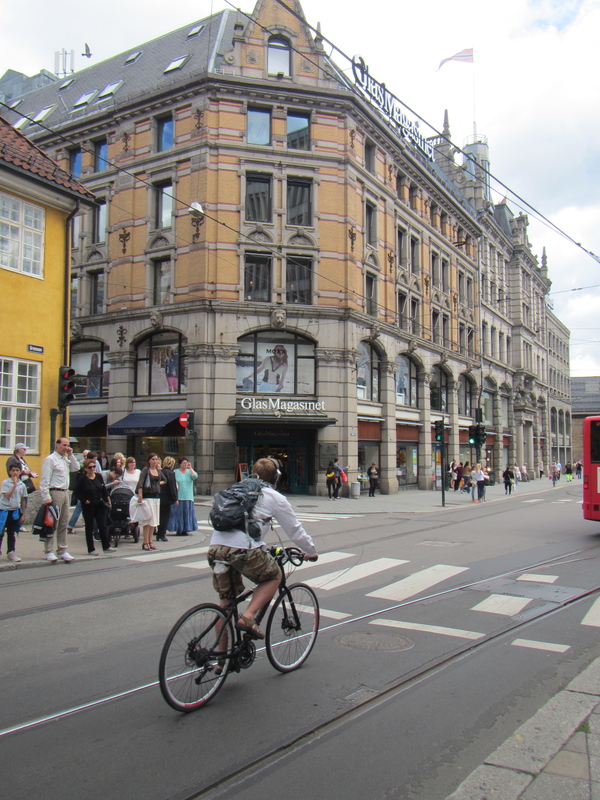 Thanks to Rick Steves’ I am taking a bike tour in Copenhagen with Mike. My chum Susie from University is going to show me her Malmo, Sweden on June 6–the national holiday to celebrate being Swedish. I have printed the instructions to find hidden Giant sculptures around Copenhagen on a bike scavenger hunt. I am excited that I am going to be able to see two more Scandinavian countries (after Norway in 2013). Originally I thought I’d get into the countryside and see more of Denmark. Then I realized that second half of my trip involves a lot of travel through England, so enjoying one city more thoroughly and staying in the same hotel is appealing. I discovered Helen Russell’s humorous memoir Year of Living Danishly at Vroman’s bookstore in Pasadena. I read it to prepare for my trip. The culture in Denmark is similar to Norway in many respects. The author refers to Jante’s Law, which I experienced growing up with a Norwegian grandfather. Aksel Sandemose outlines 10 rules for living Danishly in his novel, A Fugitive Crosses His Tracks, known as Jante’s Law. I am curious to soak up as much of the culture as I can for the relatively short time I am there, and to find out more about Jante’s Law. The mission is to inspire conservation of the ocean. The Monterey Bay Aquarium is a gem of an aquarium. It is a truly excellent place to visit if you have children, but even has a lot to offer adults. In addition to the delightful permanent exhibits with the Kelp Forest (with sharks), Sea Otters, Jellyfish and Penguins, the Aquarium hosts special exhibits. Thanks to the animated film Finding Dory and the Octopus hero Hank, octopi have been rehabilitated in the public consciousness. I’ve always admired the intelligence and ingenuity of octopi so I enthusiastically entered “Tentacles.” It was worth it just to see the Giant Pacific Octopus. Wow. Nearby is an excellent exhibit on plastics in our oceans and what we can do to reduce this insidious pollution. I particularly enjoyed various artists’ use of plastic to make sea-inspired collages. You can read more about this issue on the Aquarium’s website. You can eat at the Aquarium’s cafe, or enjoy your picnic lunch outside on one of the observation decks. The brilliance of rehabilitating an old sardine cannery is more obvious when you stand on a deck extending over the Monterey Bay. I’d actually like to come back on a bad weather day! I do not like to eat a lot of fish, but I know fish is a healthy choice. I have used my concern over commercial over-fishing to avoid ordering fish at restaurants. Now I can download the Aquarium’s Seawatch App on my phone to check for safe options to enjoy fish guilt-free. Check it out. I used my AAA member discount to buy my ticket through the AAA website, even so, it is $50 to visit. This may not make you blink, but it does make me pause. I want to be able to spend 2.5 hours or more at that price. I had not been in years–the penguin exhibit had not been added so it was probably pre-1998–and I wasn’t sure I’d visit more than once a year. Once I experienced the variety of exhibits and spent time on the deck watching the sea, I realized I want to make it more of a habit and I want to share it with my grandson. So I went to the membership desk and converted my ticket to a membership. Watch this space for reviews of the special tours and member events. Tevis observed that I always seem to spend the most time in countries that are known for their wool, knitting and sweaters. He is right: Ireland, UK, Peru, New Zealand, and now Norway. Our last full day in Bergen it was pouring rain, so I left Tevis working in the room and I went on a yarn adventure. I started with the yarn shop closest to my hotel. It was well-lit and had great sample projects in the window. Nellfrid, the shop clerk spoke broken English and I said I only knew two words of Norwegian “tak” (thank you) and uffda, although I haven’t heard anyone say uffda. Nellfrid explained that uffda is more commonly shortened to “uff”, like the weather today, uff. I really wanted to buy the yarn for a project in the window for Cameon’s daughter. Alas they didn’t have enough yarn or the pattern. Nellfrid sent me on my way with directions to a bookstore and another shop across town. “Across town” is about 10 minutes walking. On the way I stopped at the Norli bookstore. It is strange travelling in a country where the bookstores are not a temptation (almost everything is in Norwegian). Good thing because bookstores still abound in Norway. They did not have any interesting knitting books in English, so I ducked out quickly went to the yarn shop in the very touristy section of town that one blogger called “similar to JoAnn’s”. I actually liked the cosy basement full of yarn. The clerk spoke English and she explained that they did not have the full line of Rauma yarn and directed me to Husfliden. 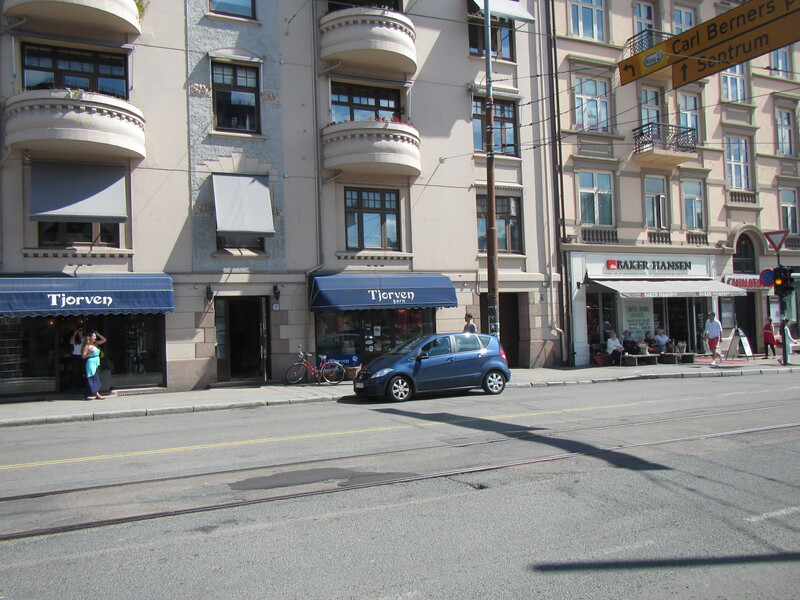 This is where I bought yarn in Oslo. Actually, not. The shops look identifical (same goods, type of displays, etc.) But the clerk assured me that they were not related. They had the yarn and the “recipe” I needed (insert sound of cash register). I am going to have an adventure using Google translate. Or I will impose on Susie and trade some services. 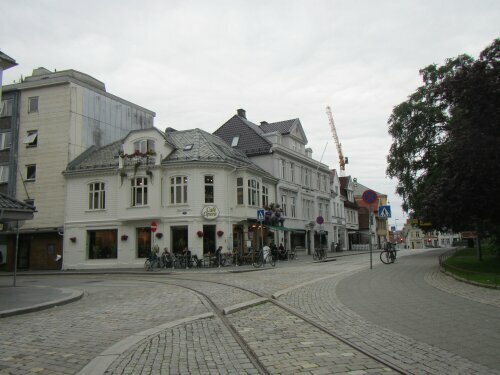 Now I was close to the train station and I remembered that there was a good coffee shop there as well as a yarn store called Norwegian Spirit. By now it was pouring. The coffee and chocolate croissant revived me. I also met a delightful waitress Cecilie. 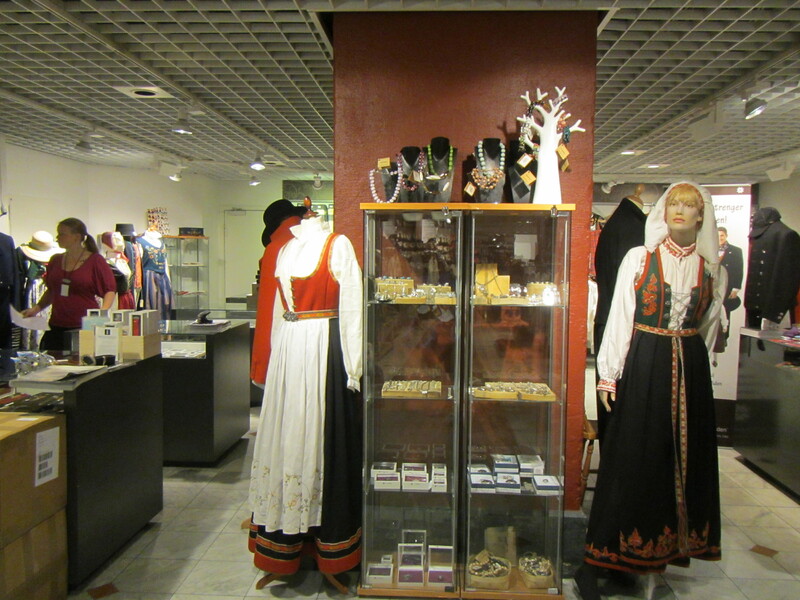 The Norwegian Spirit had some ready made traditional sweaters and some others made by the shopkeeper, a textile artist. They also had a recipe book from the original designer for Oleana Knits. (Insert sound of cash register here) That led me to the Oleana flagship store. The factory is just outside Bergen. And wow! The designs and the prices are amazing. While skeins of wool are a bargain, ready made sweaters are not. I was starting to flag Thought about jumping on the bus and going to the Knitting Factory and Museum but the rain and my soaked feet prevailed. I hit one more store where I was rewarded with a penguin. I practically skipped back to the hotel–I had such a good day. For a smallish town they have a lot of yarn shops. Nellfrid says knitting is very popular due to the weather. Tevis was still working hard and I wanted to watch the Tour de France with company. I ventured out again and after a couple of tries I found Finnegan’s Irish Pub. The Pub Man, from Manchester with an Irish mum, loves Le Tour too. He was having all kinds of difficulties opening (no hot water, etc.) However, he was more than happy to set me up with the Tour on television–on the British sports channel so it was in English!–and at one point he locked me in so he could pick up parts. He popped in every so often to find out how the race was going. By the time Kittel won the sprint and the stage the pub was filling with customers. Lovely, lovely day. Postscript: I have learned the hard way… take patterns in your native tongue when you travel so you can wool shop for projects you know you can complete! 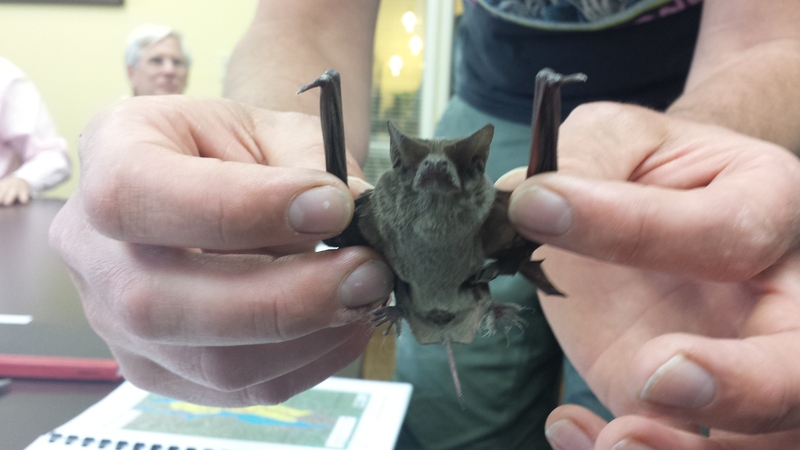 In an Aboriginal tale the bat Narahdarn releases death into the world. I love reading mysteries and I love reading travel books. This month I moved my household and I seriously pruned the contents of my bookshelves. I also found a couple of books that I forgot I had bought to read. One is Jo Nesbo’s The Bat. It is the first of his Harry Hole mysteries. Interestingly, his books are not mentioned in Nancy Pearl’s Book Lust to Go. But is was mentioned on a page of Oslo tidbits in National Geographic Traveler. Harry Hole is a police detective in Oslo, but this first murder mystery is set in Sydney, Australia. Besides being an entertaining mystery novel, it is making me want to visit Sydney. “They descended a staircase that wound down to one of the big tanks. “The tanks aren’t actually aquariums in the true sense of the word, they’ve just enclosed a part of the Sydney Harbour.” Brigitta said as they entered. From the ceiling a greenish light fell over them in undulating stripes and made Harry feel as if he were standing on a mirrorball. It was only when Birgitta pointed the torch upward that he saw they were surrounded by water on all sides. 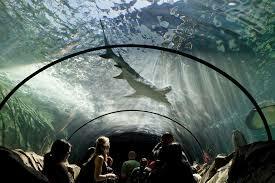 They were standing in a glass tunnel under the sea, and the light was coming from outside, filtered through the water. A huge shadow glided past them, and he instinctively recoiled. You will have to read for yourself about his encounter with a great white shark. If you knit (or crochet) and you are visiting Oslo for a day or more, then you have three great options for wool shopping. In Norway, if you see “strikke” on the shop window then it is probably a wool or yarn store as we know it in North America. If you are cruising the Nordic countries and docking briefly in Oslo, there are two shops within walking distance of the port. 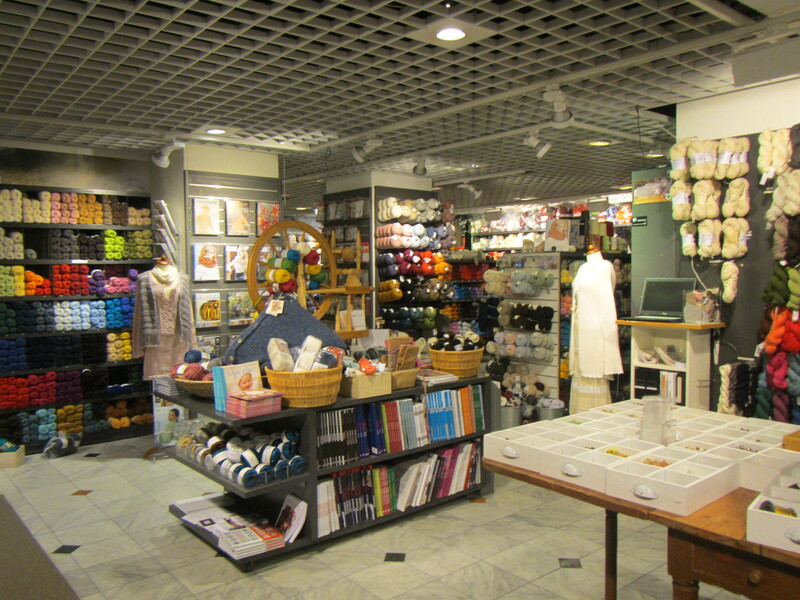 The first, Strikkedilla (translated as Knitting Craze) is conveniently located in the Oslo City mall (a highrise next to the main train station). The mall includes a grocery store, so be sure to check out the aisle dedicated to nut butters! The knit shop is the smallest of the three and jam-packed with colorful fun projects children would like to wear. The second shop is my favorite of the three, Husfliden. It is inside the department store Glasmagasinet at Stortorvet 9. I was a little befuddled at first by this idea of a department store; it was a bit more like a mall without walls. In the basement I found the yarn, buttons, traditional costumes, and many other beautiful textiles. It was a feast for the eyes and fingers. They also offered readymade Oleana sweaters. If you only have time to browse one store, make it Den Norske Husfliden. 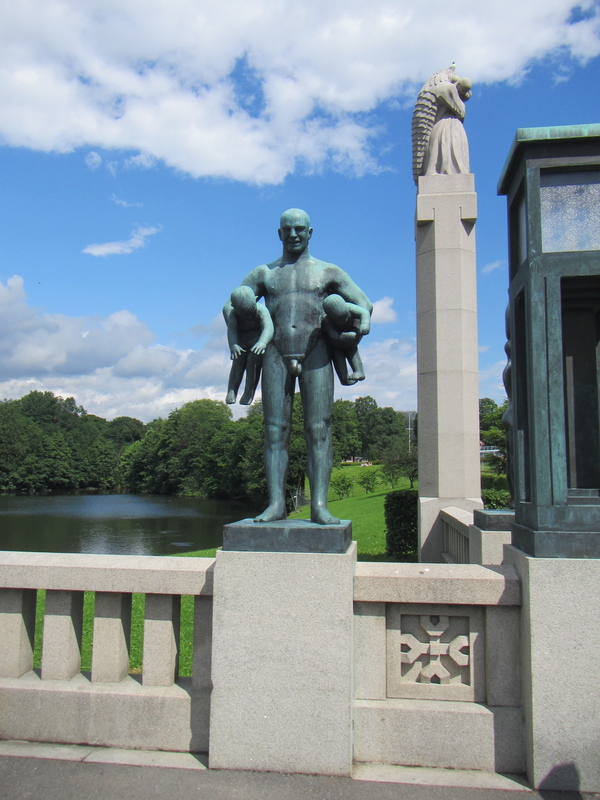 If you are taking a day trip to see the Vigeland Sculpture Park, there is a yarn shop a stone’s throw from the metro station (Majorstuen) for the sculpture gardens. I did not spot Tjorven at Valkyriegata 17 right away, so I have included a photo. The clerks were friendly and the yarn lucious. They did not offer any patterns in English (they call them recipes). I realized too late that it would have been smart to look for some patterns on Ravelry before I went shopping. The store clerk showed me a website that has language choices including English. These are the same Norwegian inspired (modern, not traditional) patterns featured in Drops magazine. There are also two readymade wool shops that offer beautiful, albeit expensive, sweaters and other wool garments. 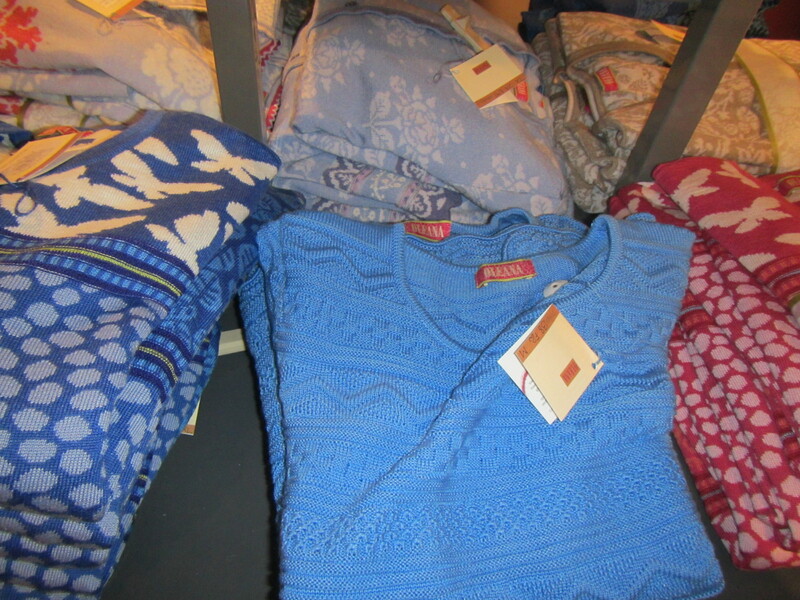 Dale of Norway at Tullins gate 5 offers more classical sweaters and made me want to go skiing. Oleana garments are inspired by traditional Norwegian design updated with a modern twist and a more colorful palette. 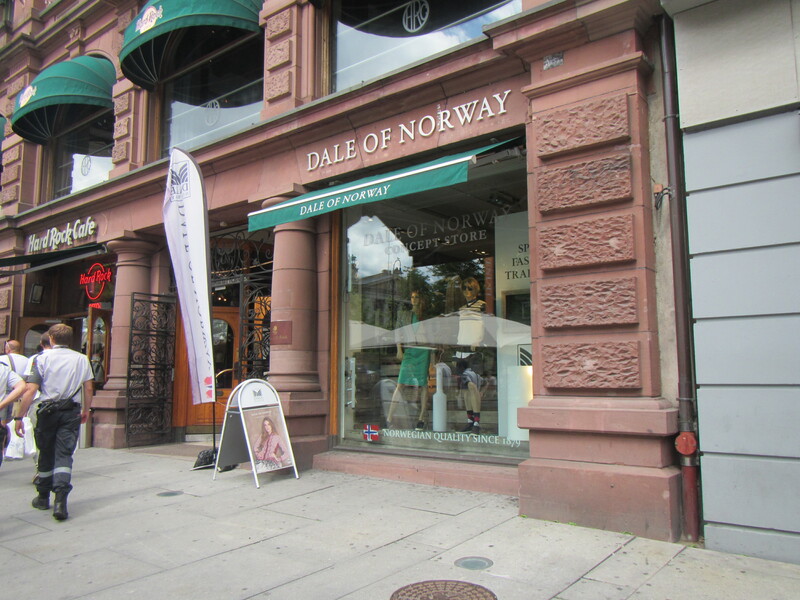 It is Dah-ley, not Dale like Yale next to the Hard Rock Cafe in Oslo. No yarn for sale here. One challenge with yarn shopping in Norway is the patterns are almost all in Norwegian, of course. I bought a couple of patterns with yarn to make them, thinking that between Google Translate, friends who speak Norwegian and my knitting experience I could figure them out. Hah! Not yet. When I return to Norway I am taking some patterns that I want to make and then shopping for wool. All of these shops are perfect if you need a tool, or inspiration. I visited these three shops in July 2013, and I have just checked and they are all still in business. I also used Linda Marveng’s blog post as my guide. 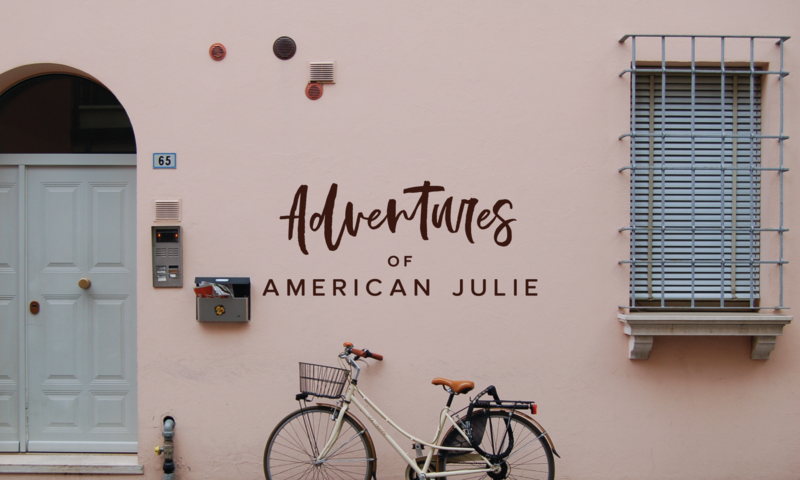 She lists additional shops and I visited a few others; however, I am including my favorites here. 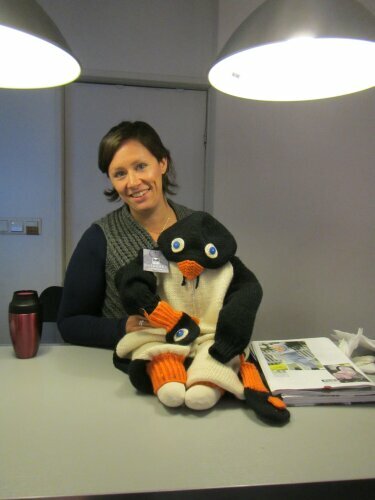 Linda Marveng is also enthused about Norway Designs, just know that there is nothing knitting related in the shop. Norway can be one of the most expensive countries to visit in Europe, so I was very pleased to find wool prices a comparative bargain. Shops are both plentiful and the ones mentioned here carry a good variety of quality yarn. It is good to be in a country where a lot of people still knit. There were some awesome patterns, if I only spoke Norwegian. Norway has been on my list of high priority destinations for a while. Walking around Oslo it quickly became obvious that I was operating on some old stereotypes. The Norway I discovered is delightful, modern and much more complex than these 3 stereotypes I packed in my bags. 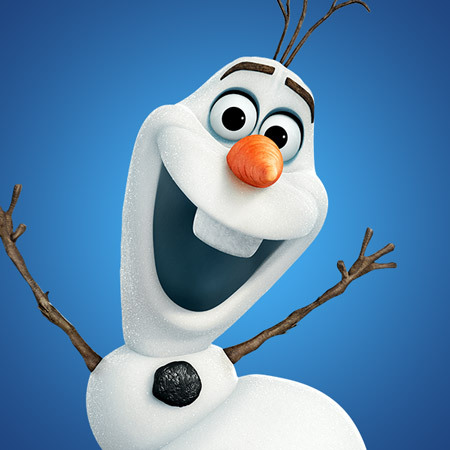 Disney’s Frozen animated fairy tale stars Olaf the snowman. The Visit Norway folks are using the movie Frozen in much the same way the New Zealand tourism industry is marketing Lord of the Rings/Hobbit. There are some challenges. First and foremost, Frozen is a cartoon. Also, much of the story’s action takes place in deep snow; whereas, most visitors plan their trips in summer–a time when the animated snowman Olaf would be distinctly uncomfortable. Modern Norway is a progressive democracy no longer ruled by royalty–even spunky princesses. 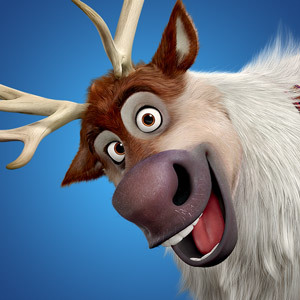 Sven the charismatic reindeer from Disney’s Frozen animated film. Many people in Europe can trace their ancestry back to a Viking invader. My grandfather was 100% Norwegian, and very proud of the accomplishments of the ancient Vikings. Norwegians are not the only Scandinavians who can claim to descend from the seafaring and conquering Vikings–the Swedes and the Danes can too. Because of my grandpa Olson, if you say Viking, I think Norway. You can certainly see Viking ships and buy an impressive variety of souvenirs with Viking stuff on them in Norway. Grandpa loved the Hagar the horrible comic strip. I have since learned that Hagar’s classic horned hat is an inaccurate depiction of what a Viking might have worn. And the modern Norwegian is more known for peace than pillage. 3. Not my Grandfather’s Norway. My grandpa was called “Ole” by his friends and he was an active member of Sons of Norway in Santa Rosa. His grandfather immigrated from Lillehammer to Donaldson, Minnesota in the 1880s. It took me a few days to realize that the things my grandfather cherished as Norwegian are actual artifacts of Norwegian life in the 1880s. These traditions of drinking coffee morning, noon and night; lutefisk, and saying “Uffda!” are carefully preserved pieces of culture that my great-great grandfather brought in his luggage and passed on to his children and grandchildren. Meanwhile, Norway’s culture continued to evolve. The Norway we discovered is more ethnically diverse, a World War II survivor, a titan of the merchant marine and an oil producing state. Hope you discover Norway sometime soon. If you have been to Norway, what was your biggest surprise? What was your favorite memory?